'All About Presentations' by Jazz Factory: How to create a Photo Album in PowerPoint? How to create a Photo Album in PowerPoint? You can change the order of the images, rotate them, change brightness and contrast and make all images black & white. 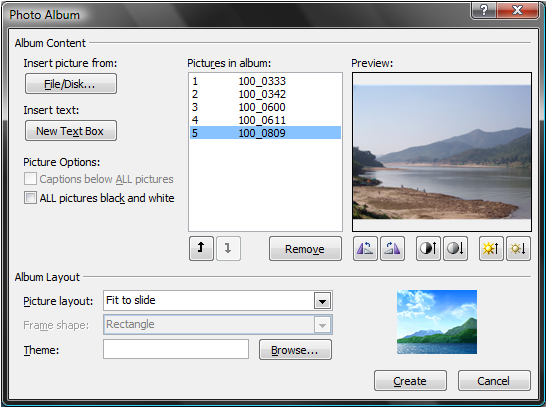 You can also choose to display 1 or more than 1 images per slide (Picture Layout). You can then choose a frame for every image (Frame Shape) and make the images look really cool. 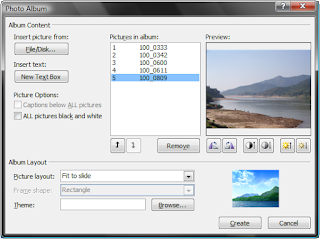 Go ahead, create a Photo Album of your family or travel photographs. Give it a nice frame. Then go to animations and choose a 'fade through black' slide transition. Apply this to all slides. To automate the album (and avoid the pain of clicking through) go to 'Advance Slide' option under Animations (it is there on the extreme right) and choose 'Automatically after 3 seconds'. Now press F5. Your photo album will start playing and change slides after every 3 seconds.